We often take our longest vacations during the summer. If a vacation involves being away from home for a week or more, we may return to find substantial damage has occurred to plants that are left unattended. This is especially true for plants growing in containers – both indoors and outside. What should we do before we leave on vacation to prepare our plants? Ideally, you would ask a friend who is knowledgeable about plants to check on your plants regularly and water them when necessary. But, if the plants will be left to survive on their own, move those growing indoors away from sunny, bright windows, so they’ll use water less rapidly. This doesn’t mean putting them in a dark room, however, since they still need some bright, indirect light to stay healthy. You can group them in your bathtub if you have a bright window, or in the kitchen sink. Putting an old towel in the bottom of the sink or tub and soaking it along with the plants will add additional humidity to the air. Temperature can also be a factor – if your plants inside are used to 75-78 degrees and you turn the AC up to 85 or more while you are away, they may loose some leaves, but will otherwise be okay as long as they get sufficient water and light. 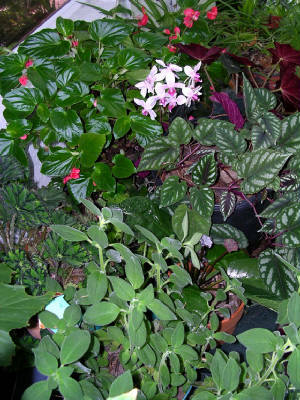 Plants in containers outside often need to be watered almost every day during the intense heat of summer. Place all of your outdoor container plants, including any hanging baskets, in a shady location near the northern side of your house or under the protective cover of a large shade tree or covered patio. 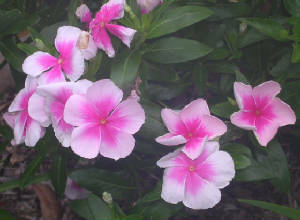 Group plants fairly close together, since that, along with the shady location, will help slow water loss. Water these plants thoroughly just before you leave on vacation. If you have an automatic irrigation system, place the containers a shady area where they will get water from automatic irrigation. Sinking smaller pots in the ground in a shady area and covering the top of the soil with mulch will also slow the loss of water. There are also some innovative self-watering devices on the market that could be helpful. However, I would want to check how they work before leaving my plants to be watered by one of these devices. Should we do anything different for our lawns? Be sure to water and cut your lawn before leaving, and plan to have it mowed during your absence, if necessary. Most lawns require mowing at least every five to seven days during the summer. Besides becoming a telltale sign that you are away, overgrowth is unhealthy for your lawn, and the grass will be unattractive and stressed when it finally is mowed. Any sign of active insect or disease problems should be dealt with before you leave, or you may return to widespread damage and expensive replacement costs. By taking these few precautions, you can protect the health of your plants and have a great vacation. Recent rains have encouraged our lawn grass to rampantly grow. Mow of ten enough so that no more than one-third of the leaf blade is removed at each mowing. Cutting the grass high increases the grass leaf surface area for photosynthesis and also encourages a deeper and more extensive root system. Keeping the mower blades sharp and properly balanced is another important part of mowing practices. Grass cut by a sharp blade will heal over more quickly and lose less water than a leaf blade shredded by a dull mower blade. Grass clippings are a valuable resource that many homeowners throw away. Raking or frequent emptying of mower grass catchers into expensive (non-biodegradable) plastic bags is hard work! But leaving the clippings on the lawn will reduce the amount of time and money you spend on lawn care. Each bag of grass clippings you leave on your lawn contains up to one-fourth of a pound of organic nitrogen that could be reused by your lawn. They quickly decay and do not contribute to thatch formation. This practice is especially important now that the Pinellas County Fertilizer Ban does not allow applying fertilizer containing Nitrogen and/or Phosphorus from June 1 through September 30. 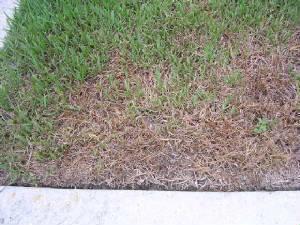 Chinch bugs are causing St. Augustine lawns to look like straw. Damage usually begins near driveways or sidewalks where heat builds up. Uses a lawn pesticide labeled for chinch bugs and apply it according to label directions. Neem oil is a less toxic alternative shown to be effective against chinch bugs. 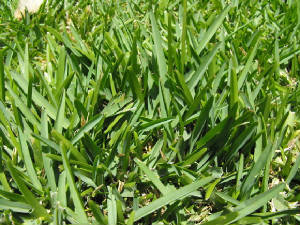 Research at the University of Florida has shown that chinch bugs lay more eggs on grass over-fertilized with Nitrogen. When you fertilize, chose fertilizers with at least 50% slow release nitrogen and apply at the rate of one pound per 1000 square feet of lawn. During the Pinellas County summer fertilizer ban, apply Iron Sulfate to green up the lawn without the producing succulent growth that is so tasty to chinch bugs. Summer brings rampant plant growth and lots to do to maintain the landscape. Check this list to keep your landscape looking good, but also allow some time for lemonade in the shade. Plant heat and sun loving summer annuals such as Angelonia, celosia, gillardia, marigolds, portulaca, Madagascar periwinkle, and narrow-leaf zinnias. Pinch off faded blossoms to keep new blooms forming. Put down a layer of organic mulch two to three inches deep around the plants to help conserve moisture and keep down weeds. Be sure to keep mulch two inches away from the base of all plants to allow air circulation and discourage fungal disease. You can sprinkle Preen pre-emergent herbicide over the mulch to prevent any weed seeds from sprouting. Follow the directions carefully to avoid damaging existing plants. Prune dead parts from shrubs, trees, and herbaceous plants anytime it appears. Dead wood and stems are the perfect entryway for disease and wood eating insects. Wander through your landscape weekly and look for signs of damaging insects. Catching infestations early allows for easier control. Watch for beneficial insects that are controlling the pests. They may be taking care of the problem for you. When treating for insect pests, use the least toxic method like insecticidal soap or Neem oil first, and only treat where the pest is found. It is usually not necessary to treat the whole landscape. Always follow the directions on the label very carefully when using pesticides. 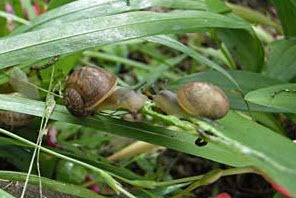 Watch for snails and slugs eating tender leaves. They can be controlled with a product containing Iron Phosphate. Iron Phosphate, unlike other chemical baits, is safe to use around pets and wildlife. Black spot on roses can cause defoliation rapidly during hot humid weather. Control by spraying with a suitable fungicide and by removing and destroying all infected leaves including those on the ground. Better yet, plant disease resistant rose varieties like the “Knockout®” roses. The small back lubber grasshoppers seen earlier this year are now maturing into the very large adult grasshoppers that are yellow with dark markings and a red area on their wings. Once they reach this size chemical controls are of little value. Consider paying some children to catch them and dispose of them in a bucket of soapy water.